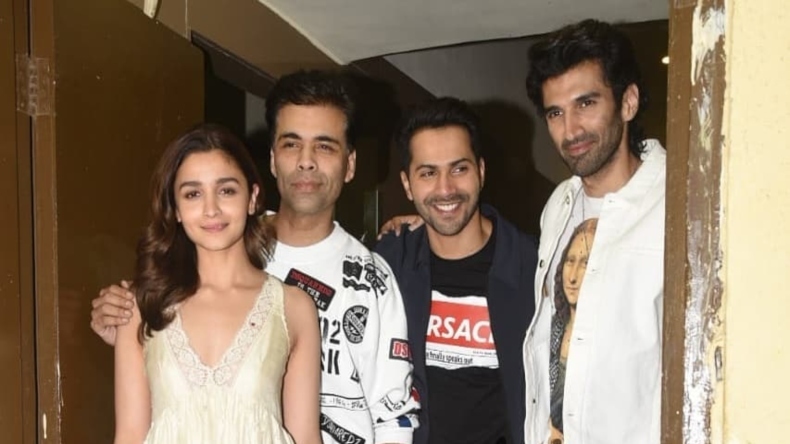 Kalank screening: Kalank starring Alia Bhatt, Varun Dhawan, Aditya Roy Kapur, Sonakshi Sinha, Sanjay Dutt and Madhuri Dixit is slated for a theatrical release on April 17. A special screening of the film was held last night in Mumbai that witnessed Celebrities like Alia Bhatt, Aditya Roy Kapur, Varun Dhawan, Karan Johar, Madhuri Dixit, Poonam Sinha, Shweta Bachchan in attendance. One of the much-awaited films of the year, Kalank starring Alia Bhatt, Varun Dhawan, Aditya Roy Kapur, Sonakshi Sinha, Sanjay Dutt and Madhuri Dixit is all set to hit the silver screens. Before the film releases, the makers held a special screening for close friends and family in Mumbai on Sunday, April 14th. Celebrities like Alia Bhatt, Aditya Roy Kapur, Varun Dhawan, Karan Johar, Madhuri Dixit, Poonam Sinha, Shweta Bachchan among others marked their presence at the screening. For the film screening, Alia opted for a white dress with golden heels and dewy makeup, Sonakshi was seen in a peach suit with white palazzos and embellished juttis and Madhuri graced the event in a chikankari floor-length ivory suit. Meanwhile, the Men of Kalank i.e Aditya and Varun kept it casual with statement t-shirts with denim, sneakers and jacket. After the screening, the team of Kalank also posed for the paparazzi. The early review of Kalank from UAE censor board is also out now. In a twitter series, a reviewer said that Kalank needs to be watched for the amazing chemistry between lead pair- Varun and Alia, its musical score, violent narrative and dramatic content. He added that the film is a sure shot super hit. Helmed by Abhishek Varman and bankrolled by Karan Johar under the banner of Dharma Productions and Fox Star Studios, Kalank will hit the theatrical screens on April 17, i.e Wednesday. The advance bookings of the film have started. Looking at the buzz around the film because of its magnificent sets, promising star cast and foot-tapping songs, Kalank is expected to emerge as a blockbuster.